The bottom line remains the top priority for businesses, so reducing power costs and increasing density will be primary goals for data center teams in 2017 -- especially those seeking to launch converged systems. The high power density requirements for converged architectures require admins to carefully measure their power and cooling metrics to ensure a successful deployment. Analyst firm IDC predicted 80% of organizations will experience delays in converged infrastructure deployment due to insufficient planning around power and cooling. "More often than not, our data centers that hold very high-tech equipment are actually low-tech environments, but this is changing," said Jennifer Cooke, research director at IDC. Smarter data centers -- with monitoring tools to help admins better understand power and cooling resource usage -- will help IT make the push toward convergence and, eventually, software-defined infrastructures. Monitoring is a critical part of data center power management, and it will allow IT teams to take charge of their energy consumption in 2017, agreed Robert McFarlane, principal in charge of data center design at consulting firm Shen Milsom Wilke LLC, based in New York, and a TechTarget contributor. Low-cost power meters will allow IT to track what is being used and identify their base usage. Teams can then take steps toward greater efficiency and identify zombie servers and other equipment that might lead to unnecessary power costs. Still, monitoring tools address only part of the power management issues that IT organizations must face. Energy costs continue to rise, and while paying for power is nothing new, not all power supplies are created equally, according to IDC. IT must not only squeeze more out of their power sources, but ensure their power is predictable in terms of both reliability and price. 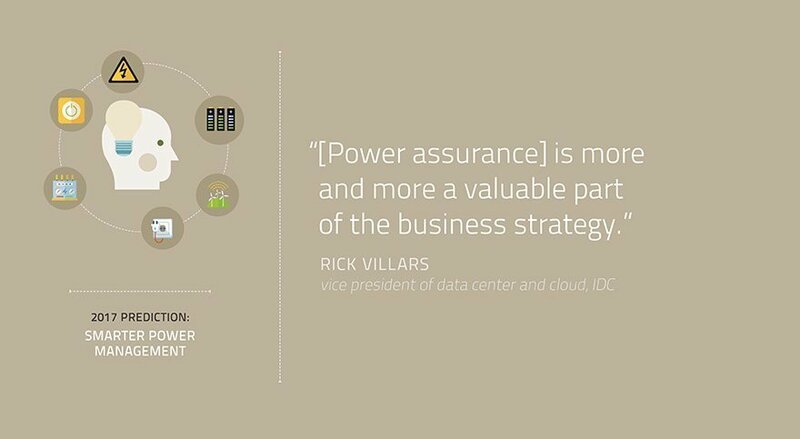 This need for "power assurance," as IDC calls it, is expected to be one of the top data center industry trends in 2017, prompting more organizations to look into wind farms, solar facilities and other alternative sources. "This is more and more a valuable part of the business strategy and being able to shift power sources based on time of day, costs, source and other resources," said Rick Villars, president of data center and cloud at IDC. What power initiatives have you taken to reduce costs and increase predictability?